A writer for Automobile Magazine, Rehbock knew exactly where to go for some insight from millennial buyers. 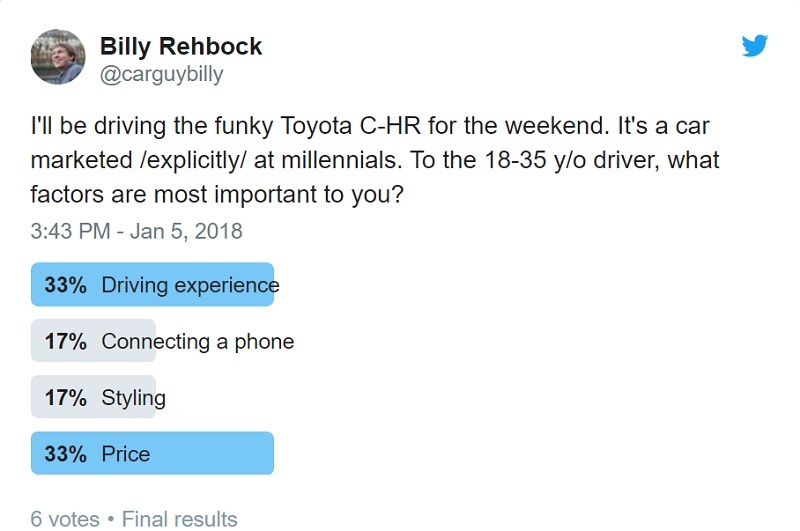 Twitter users between the ages of 18 and 35 years old were asked to choose one feature that was most important to them when purchasing a new car. Unfortunately, only six of his readers voted so the poll isn’t an accurate representation of said age group, though it does give us an idea of what buyers are looking for. When it comes to pricing, the entry-level C-HR has a starting price of $22,500 and those opting for the XLE Premium trim will have to shell out $24,350. Depending on who you ask, this could be considered expensive and Rehbock thinks it may be handicapping the C-HR when it’s pitted against rivals like the Subaru Crosstrek, Mazda CX-3, and Jeep Renegade. On top of that, the C-HR’s 2.0-liter inline-four engine seemed lackluster to him with its 144 hp and 139 lb-ft of torque. Of course not every potential millennial buyer will be of the same opinion as him. Let us know below, if Toyota has missed the mark or hit a home run with the C-HR. I think the price point is fine on the CH-R, even at the highest trim. I do have to agree with Rehbock however about its powertrain offering, as I think offering a turbo charged engine, should have been a natural solution. Seeing as how there are rumors of a TRD CH-R hitting Japan, we may see a higher performance variant of the CH-R come to North America yet. and the dumb infotainment is absolutely sub-par. The Japan CHR are awesome though - and widely popular. A lot of accessories, body kits, hybrid option. There's a hybrid model in Japan already? Doesn't look like that offers much of an increase to power, and I haven't been able to find the EPA fuel economy for it. The C-HR was originally supposed to be a Scion car, so options are limited in North America. Toyota needs to start standardizing their cars because it's not fair for Japan to get everything under the sun and we get minimal options. yeap they have the hybrid model and an LED model. Then again, I'm not looking for power, just more mpg. I remember seeing that concept. Too bad they didn't make the CH-R under Toyota mono-spec enough like what Scion would have done. Hopefully the CH-R's success in Japan will force Toyota to make adjustments to the NA model. I know so far that their sales here have been less than what was expected. I think a hybrid setup is destined to come here...eventually.